1939: A view of the Trent Board's Hatchery. In the foreground are the rearing and stock ponds, and in the background the fry ponds, the hatchery (long building to the left) and offices. The water supply to the ponds was from a spring, by means of a borehole five hundred feet deep. 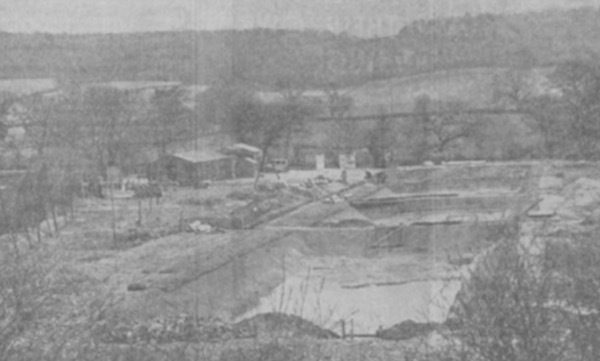 In 1940 the Trent Fishery Board, a precursor of the Trent River Authority, opened the Calverton Fish Farm, on Moor Lane, with the aim of breeding thousands of fish to stock rivers and still waters around the country. The farm consisted of sheds containing hatching trays and sixty-three ponds in nine units of seven ponds each. 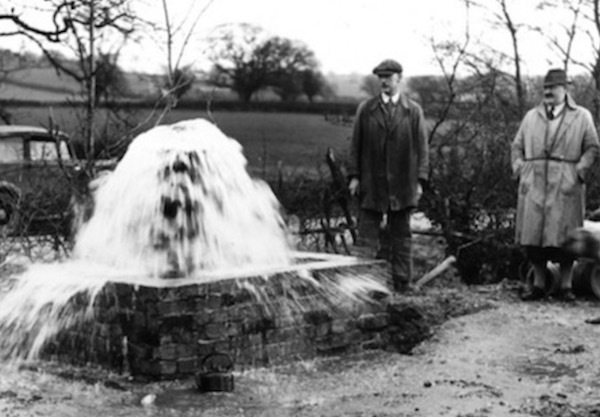 The water supply to the ponds was from a spring, by means of a borehole five hundred feet deep. In December 1941, some 12,000 fish, including carp and bream, were brought from the lake at Highfields park. The farm was already hatching out salmon and trout, and hoped to be fully stocked by 1942. One and a half million fish of seven different species, varying in size from fertilised egg to four inch 3 year old's, are reared under the careful watch of Ian Rockley, Alan Henshaw and the staff of the Environmental Agency's Calverton Fish Farm, which in recent years has become the most prominent of its type in England. The leader in fish farming, conservation and research in the country, restocking rivers, lakes, reservoirs and canals nationwide. Intrigued by the anonymity of the place, I was granted an afternoons tour by Ian Rockley (left), who also farms sheep and has a lifelong interest in fish, rearing them as pets. 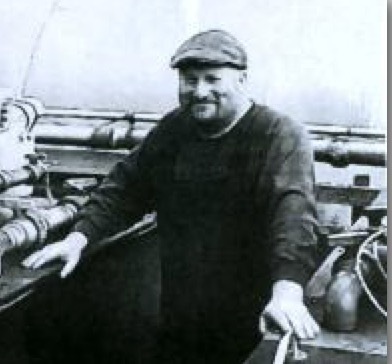 One of the first things Ian made clear was that this was 'farming' - everything relating to the complete development of the fish until release into the natural environment was carefully, meticulously controlled to ensure the best product. The water had to be the best -- river or stream water for rearing purposes will not do as unfortunately it is already polluted with human and animal hormones, which survive sewage treatment, and these genetically distort the young fish. All the water used on site is supplied from their own 360" deep borehole capable of delivering a million gallons a day. Oxygen tanks attached to the borehole delivery system enrich the pure water from 60% to 100% oxygen saturation, giving the young fish a healthier start than even in the wild. From January to June the fish are kept in tanks, each roughly the size of a skip. 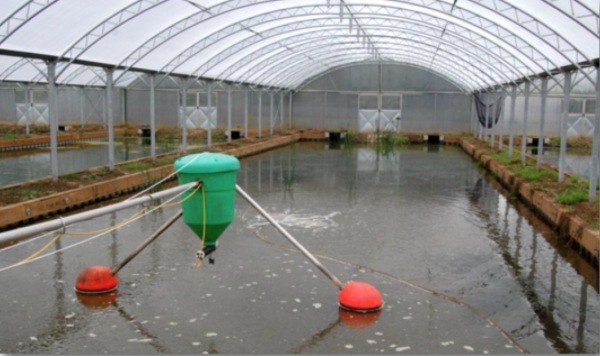 About 60 of these tanks house the fish, all seperate into their individual species, while the outdoor ponds are prepared, 15 ponds are enclosed in polythene tents, each pond, larger than a tennis court. In January the ponds are completely drained and cleaned, the linings resealed and effectively sterilized, then refilled with borehole water, and stocked with algae which blooms into a rusty brown colour. Zooplankton begins to feed on the algae, first Rotifers and then Daphne, gradually clearing the algal bloom, eventually leaving the water clear and rich in natural 'living' food for the young fish around the end of June. Pumps in the ponds create a circulating current to stimulate the conditions of river or stream. As most of these ponds are enclosed in polythene tents, and are greenhouse warm, free from herons and other predators, this is the 'Hilton Hotel' for our little chub or Crucian Carp, especially as an automatic feeder occasionally sprinkles in some extra supplements. A more serious side to the reproduction of quality stock is the preservation of endangered or 'at risk' species. The Calverton Fish Farm holds in reserve batches of all their stock to replace fish that have been wiped out by natural or man made disasters or pollution. Ian told me, with a wry look on his face, how a tank full of some 3000 pike didn't last long. After a week or so only 350 were left, or was it 35, I can't remember. And the myth is true - so voracious are they that they even kill themselves attempting to swallow a brother pike head first. 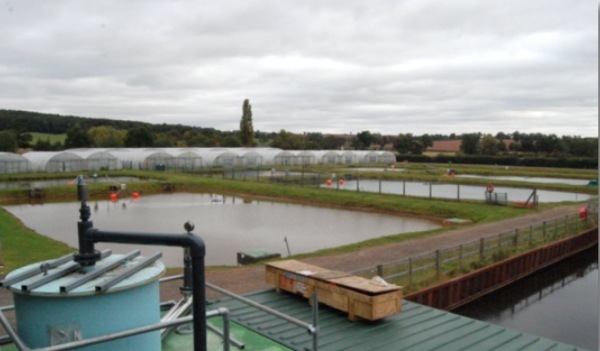 As well as breeding and preservation, much research is undertaken at Calverton Fish Farm, the place being abuzz with students from various Agricultural colleges engaged in something fishy! However, in its own right the Farm recently completed the first ever complete indexing of all the species of fish's larvae - forming a national database - a sort of identification catalogue of each fish's most infant types, which apparantly are very difficult to tell apart, much like ours. Next time you pass those big polythene sheds, next to Moor Farm Caravan Park, give a thought for those 5 people who look after those 1,500,000 fish - especially when it comes to extracting them from the ponds, where they are all mixed together, and sorting and counting them for transportation - you know what 3 year old's are like! A special thanks to Ian Rockley, a very genial host, and fish farmer extraordinary. The fish incidentally are Chub, Roach, Barbel, Dace, Crucian Carp, Tench and Grass Carp.